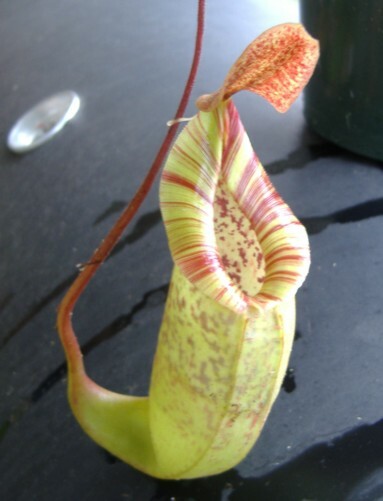 Nepenthes (sanguinea X veitchii) X fusca is an Exotica Plants hybrid between mostly highlanders. This particular hybrid appeared on the Exotica Plant's list and I was lucky to get it. About once maybe twice a year, Exotica Plants updates their list with a lot of rooted cuttings. Usually this happens around September when the weather warms up in Australia. Cuttings of some of their best hybrids appears and then goes off the list within days. I've heard that the most sought after hybrids may only have a few cuttings available. I'm growing this outdoors as a highlander and I expect no problems once the plant gets adjusted. Often it takes rooted cuttings longer than rooted plants to get going. Sometimes up to 6 months or so. I grow both parents with no problems so I anticipate this hybrid to do well for me. In fact, both parent plants are rapid growers and get into the vining stage quickly.